Blood Axis’ first album noted for featuring an interview with crazy Charles Mansun and poetry by Ezra Pound (The Voyage (Canto)). There are two “songs” on the album that really strike me as significant. The first is track 5, Herr nun lab in Frieden (Men now live in peace) in which an excerpt from Moynihan’s interview with Charles Manson features. Manson talks about his grandfather’s realisation of the futility of war in the trenches during World War I. 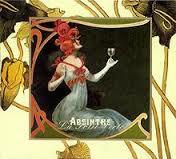 The second is Absinthe (track 7) which is a tantalising taste of Moynihan’s then future collaboration with Le Joyaux de la Princesse. Despite the album’s perceived intellectual leanings toward far right fascism, mostly due to Pound’s presence and his political beliefs and poetry by Nietzsche, Blood Axis’ Michael Moynihan has denied such a connection. During the nineties, this album, industrial, neofolk and other similar genres became synonymous with neo-nazism notably by those fearful of the rise of gothic movement following the shootings by the Trench Coat Mafia at Columbine (conservative Americans). It helps, if, like me, you first approach the album without knowing the alleged political and philosophical subtexts within the music. Indeed, taking the supposed philosophies and politics away from the album and approaching it, like I did, as a work of art, is not a difficult thing to do. In doing so, you actually can appreciate a dark, intellectual and thought provoking selection of music combining poetry, samples from Wicker Man and aural sound paintings similar to that presented later by Blood Axis when working with Le Joyaux de la Princesse on their collaboration Absinthe. We first came across Blood Axis on his collaboration with Le Joyaux de la Princesse. If you recall, he’s the guy who reads all the English translated French poetry to weird atmospheric remixes of gramophone records. Oh yeah, he gets better. Truly. So here we are at his third studio album, Born Again. Michael Moynahan menaces his way through 12 tracks of moroseness. Great stuff. Of course you’ll only really appreciate how good when people tell you that the music you’re listening to is a racket and can you please turn it off. Which happens everytime with Born Again. I love it! Possibly not as much as his first studio effort, Gospel of Inhumanity but not that far off.